Date: Tuesday, 29th September 1970. 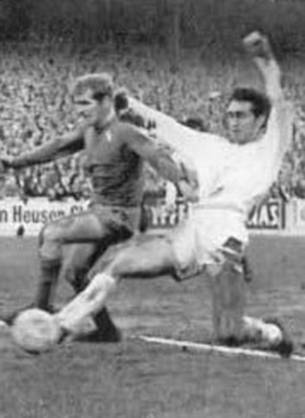 Competition: Inter-Cities Fairs Cup, First Round, Second Leg. 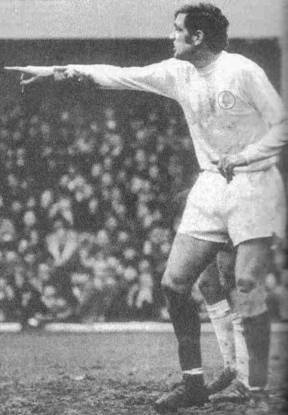 Score: Leeds United 5 Sarpsborg 0. 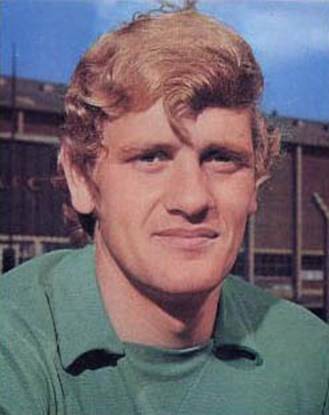 Scorers: Leeds United: Charlton (2), Bremner (2), Lorimer. 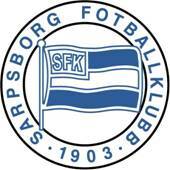 Sarpsborg: Nil. 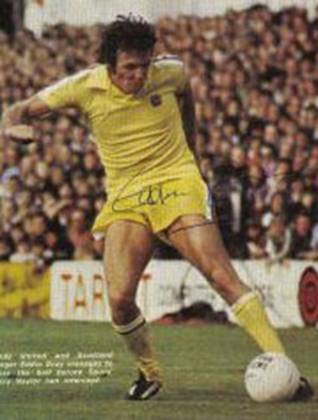 Leeds United: Sprake; Madeley, Cooper (Reaney); Bremner, Charlton, Hunter; Lorimer, Clarke, Belfitt, Bates, E. Gray. 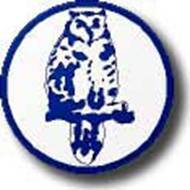 Sarpsborg: Nilsen; Loeken, F. Johansen (Holt); Woodruff; Gjeraugsen, S. Johansen; Kjoenigsen (Melby), Andresen, Olsen, Spydevold, Vanestad. Referee: Mario Gomez Alves (Portugal). After beating Lyn Oslo by a club record 10-0 the previous season, United were expected to account for their fellow Norwegians with ease. 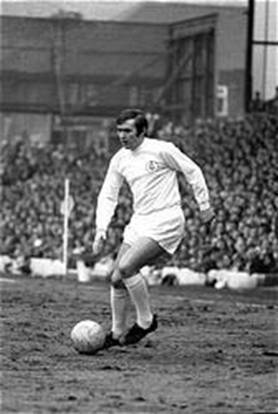 They welcomed the return of their big guns, Jack Charlton, Norman Hunter, Allan Clarke although they were still without Johnny Giles for whom Mick Bates carried on as his deputy. 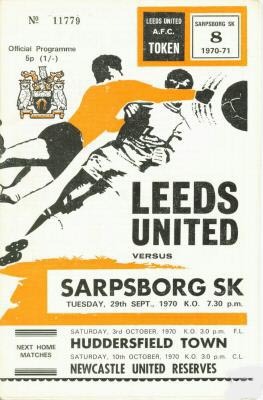 Sarpsborg, sounding more like the name of an imaginary side Roy Race’s Melchester Rovers would come up against, were no match for United in the second leg at Elland Road and crashed to a 5-0 defeat. 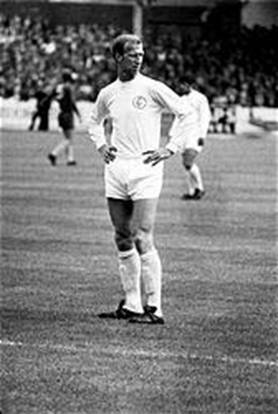 Jack Charlton and Billy Bremner scored two apiece to start the ball rolling in another successful European campaign. 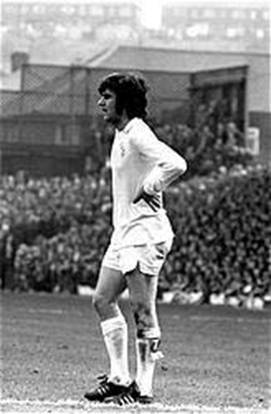 Peter Lorimer, who netted in the away leg to give United an early advantage in the tie, wrapped up the scoring on home soil. 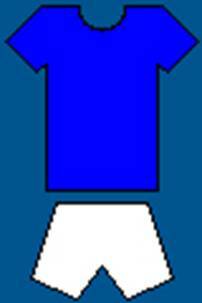 Sarpsborg arrived at Elland Road with, on paper at any rate, a slender chance of staging a shock result. Leeds had other ideas, but while in the end the result was more in keeping with the expected outcome, it wasn’t until the final thirty minutes, when the part-timer visitors became understandably leg weary, that they capitulated. 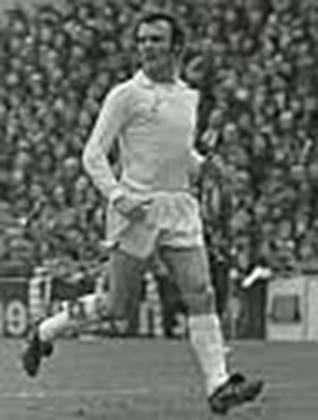 Sarpsborg relied heavily on the off-side trap in the first half, and it paid dividends, for while United had the ball in the net four times, only one effort by Jack Charlton counted, as he walked the ball into the net after first miscuing, in the twenty-second minute. 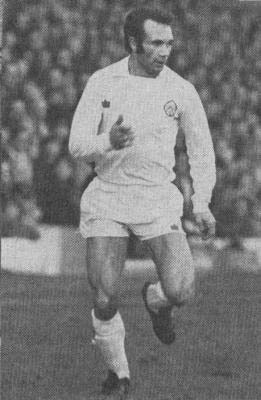 The biggest cheer of the night was reserved for second-half substitute Paul Reaney when he was given a run in place of Terry Cooper for his first senior game since breaking his leg the previous April. In the second half there was a late flurry of goals to make the score a resprctable 5-0. 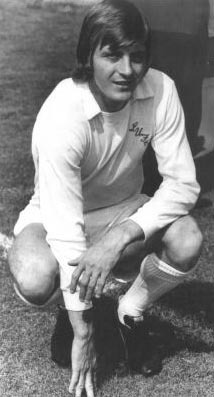 Jack Charlton notched his second with a fierce angled drive in the sixty-first minute. 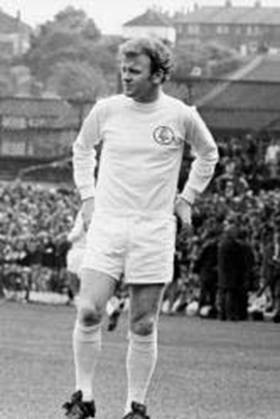 Billy Bremner celebrated his fiftieth European appearance with a twenty-five yard shot in the seventy-first and a header in the eighty-eighth minutes and finally Peter Lorimer tapped in a fifth right on the final whistle.